Ertugliflozin for Type 2 Diabetes | The Medical Letter, Inc. The FDA has approved the sodium-glucose co-transporter 2 (SGLT2) inhibitor ertugliflozin (Merck) for treatment of adults with type 2 diabetes, both alone (Steglatro) and in fixed-dose combinations with metformin (Segluromet) and sitagliptin (Steglujan). Ertugliflozin is the fourth SGLT2 inhibitor to be approved in the US. All four are available in combination with metformin and three are available in combination with a dipeptidyl peptidase-4 (DPP-4) inhibitor (see Table 3). CLINICAL STUDIES — The results of a series of ertugliflozin clinical trials are listed in Table 2. The outcomes are similar to those reported earlier with canagliflozin (Invokana), dapagliflozin (Farxiga), and empagliflozin.3-5 In the VERTIS RENAL trial in patients with stage 3 chronic kidney disease, ertugliflozin was not more effective than placebo in lowering A1C. ADVERSE EFFECTS — Hypoglycemia rarely occurs with an SGLT2 inhibitor alone or in combination with a DPP-4 inhibitor, unless the patient is also taking an additional antihyperglycemic drug. Use of SGLT2 inhibitors, including ertugliflozin, has been associated with genital mycotic infections and possibly with recurrent urinary tract infections. Use of ertugliflozin in clinical trials was associated with lower-limb amputations in 0.2% of patients taking the 5-mg dose and in 0.5% of those taking the 15-mg dose. Canagliflozin has been associated with a 2-fold increase in the risk of lower-limb amputations in patients with type 2 diabetes with cardiovascular disease or at risk for cardiovascular disease. DRUG INTERACTIONS — Concurrent use of ertugliflozin and insulin or an insulin secretagogue can increase the risk of hypoglycemia; lower doses of insulin may be needed. PREGNANCY AND LACTATION — Ertugliflozin has not been studied in pregnant women. Renal pelvic and tubule dilatations and renal mineralization occurred in pregnant rats given doses 13 times the maximum clinical dose. Adverse developmental effects on the fetus were also observed in animal studies. The label states that use of ertugliflozin during the second and third trimesters of pregnancy is not recommended. There are no data on the presence of ertugliflozin in human breast milk or its effects on the breastfed infant or on milk production. Ertugliflozin has been detected in rat milk. It is not recommended for use in breastfeeding women. DOSAGE AND ADMINISTRATION — The recommended starting dosage of ertugliflozin is 5 mg once daily, taken in the morning with or without food, up to a daily maximum of 15 mg. The starting dosage of ertugliflozin/metformin is based on the patient’s current regimen; the maximum dosage is 7.5/1000 mg twice daily with food. The recommended starting dosage of ertugliflozin/sitagliptin is 5/100 mg once daily, with or without food; the maximum daily dosage is 15/100 mg.
Ertugliflozin alone or in combination with metformin or sitagliptin should not be started in patients with an eGFR 30-<60 mL/min/1.73 m2 and is contraindicated in those with an eGFR <30 mL/min/1.73 m2. CONCLUSION — The SGLT2 inhibitor ertugliflozin, both alone (Steglatro) and in combination with metformin (Segluromet) and sitagliptin (Steglujan), reduces A1C, weight, and systolic blood pressure in patients with type 2 diabetes. It appears to be similar in efficacy and safety to other SGLT2 inhibitors, but direct comparisons are lacking. Only empagliflozin (Jardiance) is approved by the FDA to decrease the risk of cardiovascular death in patients with type 2 diabetes and cardiovascular disease. The long-term safety of SGLT2 inhibitors is unclear. Cardiovascular effects of some antidiabetic drugs. Med Lett Drugs Ther 2017; 59:136. Canagliflozin (Invokana) for type 2 diabetes. Med Lett Drugs Ther 2013; 55; 37. Empagliflozin (Jardiance) for diabetes. Med Lett Drugs Ther 2014; 56:99. 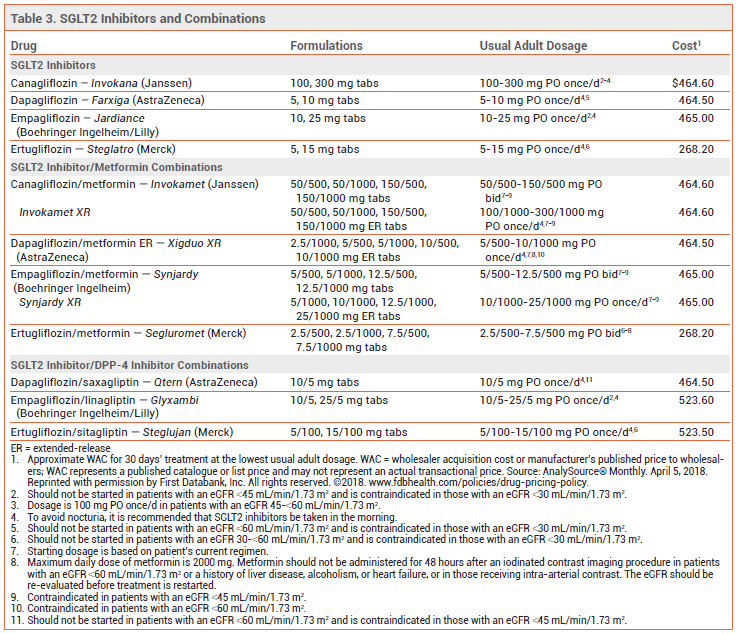 SGLT2 inhibitors and renal function. Med Lett Drugs Ther 2016; 58:91.